The Vanuatu Starling, Santo Mountain Starling or Santo Starling (Aplonis santovestris) is endemic to the island of Espiritu Santo in Vanuatu, where it is restricted to cloud forest forests. 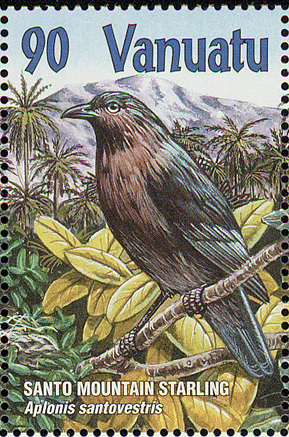 This medium-sized starling was seldom seen in the 20th century and was feared extinct, until a 1991 expedition found a population high in the mountains. They are medium-sized. The plumage is dark with a metallic sheen. They are omnivorous. Their main diet consists mostly of insects and fruit.